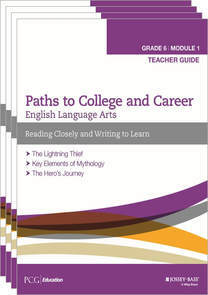 ​PCG's Paths to College and Career curriculum provides educators with lesson-by-lesson guidance to implement the Common Core State Standards (CCSS) for grade 6 English Language Arts (ELA). In grade 6, students build their ability to read closely, use evidence, write effectively and conduct research through the examination of a wide variety of fiction and non-fiction texts. Students explore mythology, social justice, the rules we live by, and build knowledge about environmental issues like pesticide use. Here's some of what students read in grade 6: The Hero's Journey, Bud, Not Buddy, Dragonwings, Frightful's Mountain​. In Module 6.1, students study the purposes and elements of mythology. Students read Rick Riordan’s The Lightning Thief with a focus on the archetypal hero’s journey, closely reading the many mythical allusions. They also read complex informational texts about the elements of mythology. As a whole class, students closely read several complex Greek myths, and then work in small groups to build expertise on an additional myth. Students then develop their narrative writing skills as they create their own hero’s journey narrative. In Module 6.2B, students explore the idea of adversity of people across time and place, and through multiple modes of writing. Students begin this module with a research-based unit on the Middle Ages. They break into expert groups to read closely about one demographic group in order to write an informational essay based on their research. Students then move on to read literature: Good Masters! Sweet Ladies! Voices from a Medieval Village, in order to identify the various adversities faced by this cast of characters and to examine the author’s craft. To conclude the unit students move into modern voices of adversity by reading poems in the books Blue Lipstick and Technically, It’s Not My Fault, and then write their own text about adversities faced by sixth-graders. In Module 6.3A, students study how an author develops point of view and how an author’s perspective, based on his or her culture, is evident in the writing. As students read Laurence Yep’s Dragonwings, they analyze how Yep develops the point of view of the narrator, Moon Shadow. They also read excerpts of Yep’s memoir The Lost Garden to determine how his culture and experiences have shaped his perspective as evidenced in the novel. They read accounts by people from the turn of the century in San Francisco, analyzing perspective and comparing the accounts to those in the novel. Finally, students write newspaper articles that convey multiple perspectives about life for Chinese immigrants in San Francisco in the early 1900s. In Module 6.3B, students continue to study how an author develops point of view and how an author’s perspective, based on geographic location, is evident in the writing. Students consider point of view as they learn about ocean conservation and the impact of human activities on life in the oceans. They read Mark Kurlansky’s World Without Fish, analyze how point of view and perspective is conveyed, and trace the idea of fish depletion throughout the text. Students also read Flush, a high-interest novel, and read excerpts of an interview with author Carl Hiaasen to determine how his geographic location in Florida shaped the perspective evident in his novel. To conclude the module, students write an informative consumer guide about buying fish to be put in a grocery store. In Module 6.4, students consider the balance between human needs and environmental consequences as they read the novel Frightful’s Mountain and complex informational texts about the benefits and drawbacks of DDT. They learn how to trace and evaluate an argument in written texts and videos on this topic, and conduct both supported and independent research. Through structured discussions and decision-making protocols, students form their own argument about the use of DDT. Students then apply their research to write a position paper in which they support that claim with evidence.